Mahatma Gandhi Antarrashtriya Hindi Vishwavidyalaya (Wardha) has stained itself again with another instance of caste discrimination in campus. 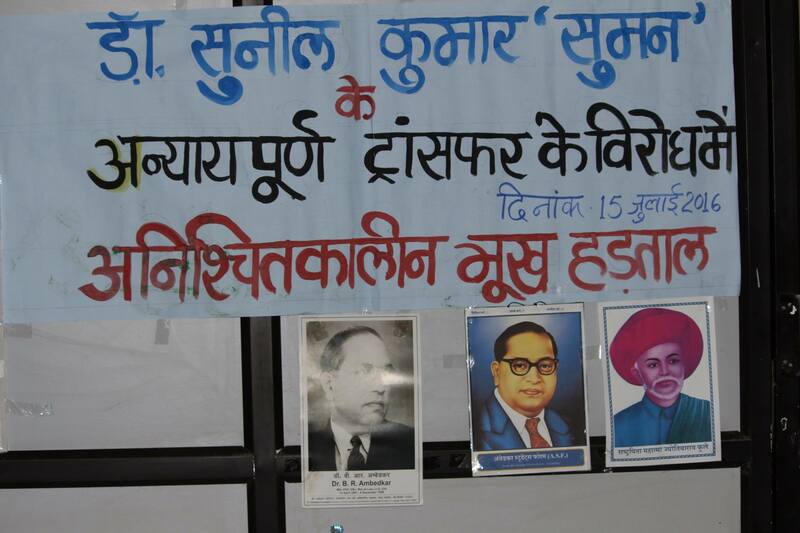 This time it is the undemocratic transfer order of the only Adivasi professor in campus – Dr. Sunil Kumar Suman. University administration has already given relieving letter to Dr. Suman for it’s Kolkata centre. Dr. Suman has been repeatedly harassed by the university since he joined there as Assistant Professor. While earlier it was through the commands of VC Vibhooti Narayan, now it’s by new VC Giridhar Mishra, both belonging to upper caste. Dr. Suman was falsely accused and charged on a Sexual Harassment case in 2013 and was immediately suspended from the university, his salary was also stopped. He moved to Mumbai High Court and won the case. Court also fined Ex-VC Vibhooti Narayan for rupees 10,000. After suspension, he was out of campus for two years and went through economic trouble and mental harassment. Even after his return, the trauma continued and he wasn’t even provided with desk and chair. Dr. Suman has still not been paid salary for those two years he spent outside campus on false charges. 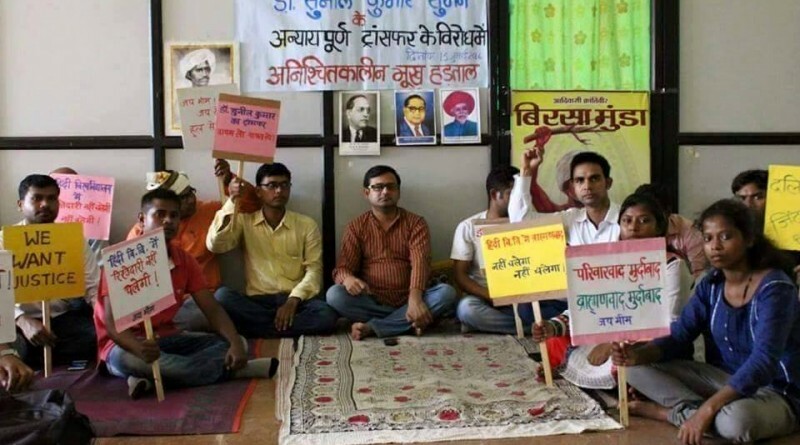 The students have accused VC Girishwar Mishra of practicing caste discrimination and making favorable administrative appointments for his family members and relatives. Moreover, since his arrival not a single Dalit and Adivasi have been appointed. Dr. Suman joined university in 2009 as Assistant Professor in Department of Hindi (Comparative Literature) and is also the only Adivasi professor in the University (located in an Adivasi dominated region of Maharashtra). He has marked his recognition at national level as writer, thinker and activist. Dr. Suman is an Ambedkarite and has been vocal on various issues in and outside campus. He has vehemently spoken against Brahminism and discrimination within educational institutions and has been working towards providing an egalitarian space for Bahujan students. Dr. Suman has accused that decision of his transfer is unconstitutional. He wrote on Facebook that, he has requested University administration many times to put stay on the undemocratic transfer order, but they have not heard his requests. With the M.Phil./Ph.D. admission interviews to begin soon, the administration is trying to keep him away from interview board- he added. After the failed attempts of peaceful request, Dr. Suman decided to go on hunger-strike against the University administration since Saturday. In his support many students and research scholars also joined in. He has also got support from the Teachers Union of the University. Dr Suman in another Facebook post wrote that- ‘earlier Britishers used to send people to Kala Paani (Cellular jail in Andaman island) as ‘punishment’. Similarly, while the former Vice Chancellor of Wardha Unviersity took revenge by implicating people (Dr. Suman) on false charges of ‘sexual-harassment’, the new Vive Chancellor uses ‘transfer’ to teach lesson. 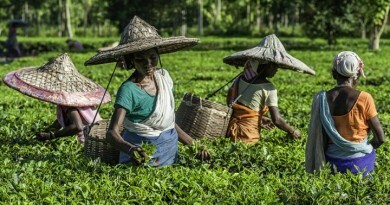 Last year one professor was sent to Kolkata for a year, as ‘punishment’. After his duration his over, now Dr. Suman is being put on punishment seat. He told that, University should be ready to face off large scale movements if the administration doesn’t take back its arbitrary decision. 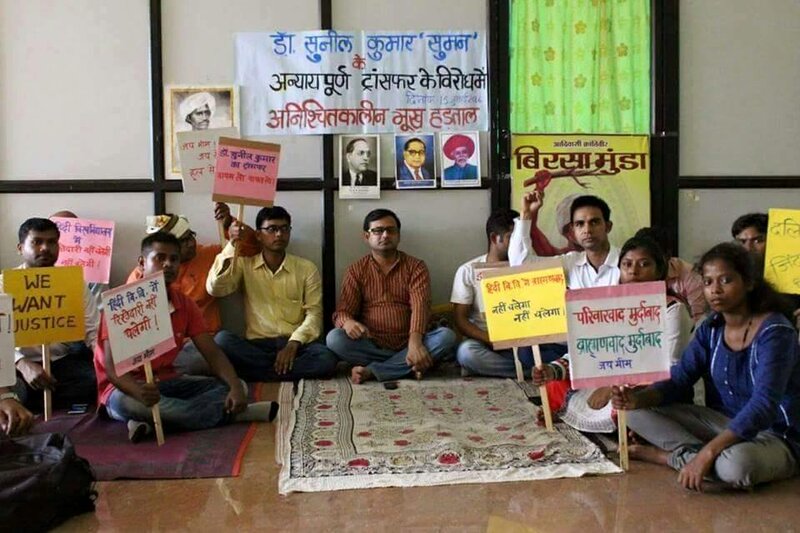 The protest against Dr Suman’s transfer saw mass resistance and solidarity on social media, and has got support from various student and community organizations. Representatives from Gondwana Yuwa and Mahila Jangom Dal, Akhil Bhartiya Adivasi Vikas Parishad took part in the protest and tried meeting VC. Along with students, research scholars, many faculties came at protest venue to support and give solidarity to Dr Suman. 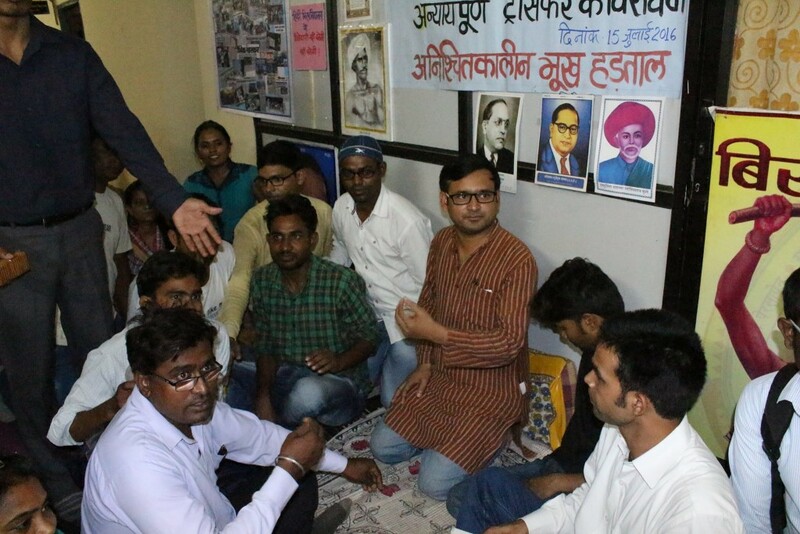 Furthermore, Student Organization- Ambedkar Student Forum has shown solidarity with the protest and has written memorandum to VC on behalf of the Union. Given the bold and powerful orator Dr Suman is and his active participation in anti-caste struggle, the transfer order comes out as just another attempt to stop the Adivasi voice of dissent in campuses. It also provides a visible reality of existing caste based discrimination in ‘modern’ elite institutions and representation of marginalized sections in these spaces. 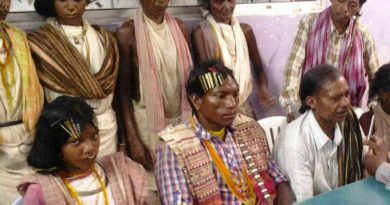 What rationale can the university give for the transfer order of an ONLY Adivasi professor in the campus? 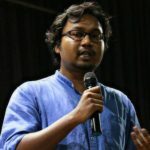 Had he kept quite against Brahminical administration, had he not been an Ambedkarite – would the harassment have stopped? Presence of faculties such as Dr Sunil certainly challenges the status quo of upper caste dominated academia and administration. And one can clearly see the insecurity and fear, with the growing presence of Dalit Bahujan Adivasi voices in University campuses.